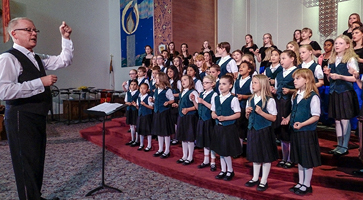 Thank you for your interest in the Spokane Area Youth Choirss. We are a performing art choral organization, committed to providing a unique musical experience where artistic expression and appreciation are developed. Our comprehensive program is designed for young people ages 7-18. During our placement interview, we seek to discover as much as possible about your child’s musical potential. We realize that at this point in a child’s life, few children have highly developed musical skills. Parents can prepare their children by assuring them they will enjoy the experience. No other preparation is necessary. Singing is an art form that can be done anywhere, requires no expensive instruments and can be done by almost everyone. Studies have documented health benefits resulting from singing, including increased antibodies, lowered stress hormones, and improved lung function. Test scores indicate that music students perform better on math, science and language arts assessments. Research indicates physical changes to the brain from music study, particularly to the left side of the brain and areas devoted to language and reasoning. Performing music builds self-confidence and a sense of teamwork. Concepts learned through singing include self-discipline and the value of sustained effort leading to excellence.